You'll be £30.00 closer to your next £10.00 credit when you purchase Dawn of Victory, Thank You China!. What's this? 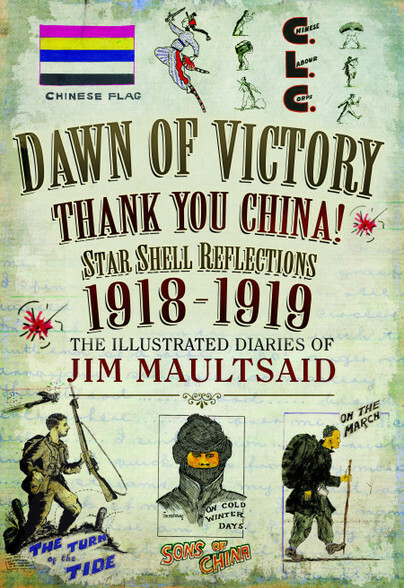 Jim Maultsaid’s third and final book, The Dawn of Victory, Thank You China! is based on his service with the 169 Chinese Labour Corps (CLC) between 1918 – 1919. There were 96,000 Chinese volunteers in the CLC and their achievements have gone largely unrecognised for 100 years. As Jim Maultsaid’s diaries and drawings vividly testify, they made a stupendous and lasting contribution both during and in the aftermath of The Great War. He writes ‘Never did I see human beings work as we worked those Chinese boys of ours’. In all weathers, the Chinese turned their hands to every kind of task, initially keeping the wheels of war turning and after the Armistice clearing the debris of war and recovering the tens of thousands of anonymous dead. Maultsaid’s down-to-earth prose and superb drawings capture the unique nature of the CLC’s efforts. His admiration for their stoic, indeed heroic efforts is obvious and, thanks to the preservation of these unique diaries, the coolies who toiled so tirelessly can at last receive long overdue credit. The author/artist served for over five years and was there to say goodbye and thank you to all those who served in his unit. This book, the final volume in a series of three, is an absolute delight packed, as it is, with insightful commentary, finely drawn sketches and nicely observed vignettes of army life during 1918 – a year that started in crisis and ended in victory for the allied armies. Unusually for such books, it succeeds in entertaining the reader without shying away from the horrors that blighted so many families touched by the war. For those who are looking for an alternative to the depressing narrative of futility, death and devastation that will no doubt characterise media coverage next year then this book will serve very well. This is a unique perspective of a number of aspects of WWI that have received little or no attention at the time, or by historians since then. The author has provided many cartoons and drawings that have been reproduced through the body of the book, using full colour as appropriate – Highly Recommended.